WW2 relics are so abundant in Europe, they have been found grown into trees. What was once a war between mankind has now become a war of man vs nature. It's been over 70 years since the end of the deadliest war in history though it may be hundreds more before there isn't any trace left. From live artillery to soldiers helmets these relics scatter the forest floor just beneath the surface. The amount of war debris is so substantial that sapling trees eventually began to sprout underneath, pushing them up and out of the ground, in some cases, they have begun to swallow them whole. I have done my share of metal detecting and WW2 relic hunting in Germany over the last few years and I have never seen anything like this. 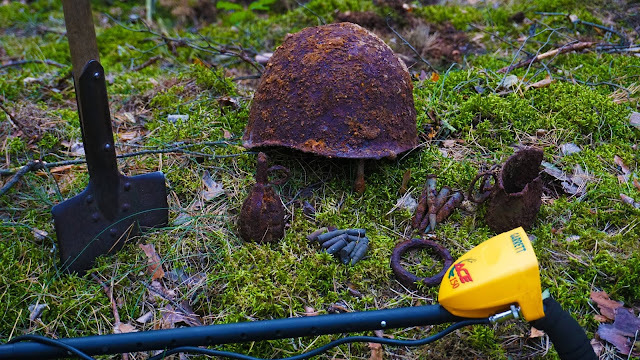 Often I find war relics just lying on the surface of the forest floor, and with my metal detector, I have found countless items just beneath the mossy surface. On my next trip I will have to keep a keen eye for such occurrences.